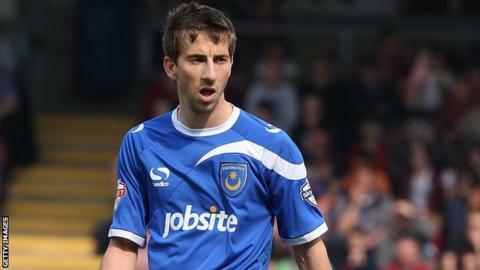 Portsmouth winger Wes Fogden is hoping to return to first-team action before the end of the season after a serious knee injury wrecked his campaign. The 26-year-old damaged the anterior cruciate ligament in his knee in pre-season training in July last year. Fogden played 30 minutes for the reserves last week, and is hoping to step up his recovery. "I have to be realistic and not get ahead of myself but I'm feeling OK and want to push on," said Fogden. The former Bournemouth winger is targeting another reserve match against AFC Wimbledon on Tuesday for more game time. "I'm told that nine months is the average for this sort of injury and it's been about seven months now," he told BBC Radio Solent. "I've played 30 minutes and there's another reserve game coming up which I'm looking to play some more minutes in and we'll go from there. "We've got some good players. I like to give everything on the pitch so not to be able to do that has been a real low for me and I'm just eager to get back out there."